My name is Rebecca. I am a preacher, writer, and a musician. I also have low vision. Growing up, I grew used to hearing people tell me, “You don’t look blind.” I struggled during my school years because many students, and even some teachers, accused me of feigning my poor vision. This statement always dumbfounds me because I do not know what a preacher is supposed to look like. I have known preachers, both men and women, who are all ages, shapes, sizes, and skin colors. In the same way, I have met people who are blind or disabled who are more varied in appearance than you can possibly imagine. Just as there is no “right way,” to live life with a disability, there is no one “right way,” to pursue your dream. At last, after my very long journey, I am beginning to start to feel love and acceptance for myself. I now view my sight loss as an important part of my identity. I have been blessed to meet so many wonderfully supportive people along the way. For every negative voice, there were even more positive voices in my life that resounded just as loudly. I want to be a positive voice who inspires other people the way others have inspired me. That is why I was decided to publish my chapbook, Through My Good Eye: A Memoir in Verse. This small book of poems is my love letter to my beloved church. It is also my statement to the world that people with disabilities can do anything that people without disabilities can do- we just do it a little differently. Poetry has always been connected to music. Blindness is not a reason for silence. My loss of vision has inspired me to keep singing out in a darkened world. 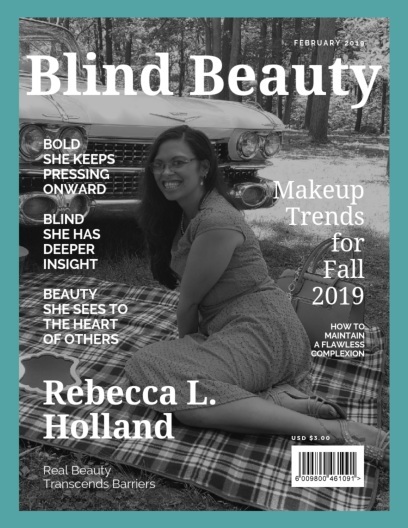 Featured image is a faux fashion magazine cover titled Blind Beauty is black & white. Rebecca sits on a plaid picnic blanket in a sunny park in front of a 1959 Cadillac Sedan DeVille. She is wearing a blue dress and smiling. She has long dark hair and wears glasses. Rebecca stands on a stool in a bookstore in front of a large shelf full of books. She smiles as she takes a volume front the shelf. She wears a striped dress and denim jacket. Next post: Worldwide Search For Models With Disabilities! I love this post and I enjoyed her articles in Captivating, too. I have just subscribed to Rebecca’s blog. Thank you Stephanae for continuing to highlight people who have come to accept and embrace their vision loss and who are living life to its fullest. My son needs all the role models and support he can get and these stories do my “mom heart” a world of good too! I can relate to Rebecca’s experience growing up. Some teachers thought I shouldn’t be in public school, and others thought I was faking my vision loss. RP was — and is — difficult to fathom, with an unpredictable field loss and drastic changes in what one can see in varying light. You walk into bright sun and can’t see anything; you walk into a building after your eyes have adapted to the bright sun, and you can’t see anything. Sometimes, I get the feeling that all of us blind people have heard that old saw about not looking blind. I wonder if it’s not because they’ve seen so few real life blind people. Good luck with your ministry, Rebecca.